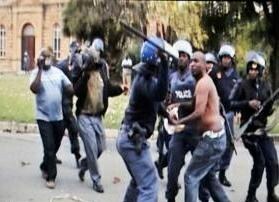 The Andries Tatane incident (Photo: Meqheleng Concerned Community). Recent high-profile incidents have drawn attention to the manner in which the police and the prison service conduct themselves. Lukas Muntingh and Gwénaëlle Dereymaeker in their joint paper consider the daily operation of South African law enforcement agencies and assess impunity emanating from that context. Lukas Muntingh presented the findings of the paper at a CSPRI seminar, highlighting the extent to which oversight institutions receive large volumes of complaints, but very few are thoroughly investigated and even fewer result in criminal convictions and appropriate sanctions. While the legislation provides that state officials must be held criminally responsible for human rights violations, this happens so rarely that the current situation can only be described as one of de facto impunity.